While PlayStation fans might not be familiar with the series, in the early 2000s developer Massive Development made a name for themselves on PC with their AquaNox series. Part submarine simulation and part shooter, the series blended these genres to create a title that stood out from the crowd. The underwater shooting required more tactical play than most shooters, but the action made it so that a great gameplan wasn’t enough to be successful. The complicated gameplay turned out to be a double-edged sword, as what won over fans also made it fail to reach a wider audience. Massive Development would end up going out of business in 2005, and their signature series hasn’t been touched in over a decade. That’s changing thanks to THQ Nordic and developer Digital Arrow, who are reviving the futuristic series with a prequel. Called Aquanox Deep Descent, it takes place on an Earth where all of humanity has been driven underwater due to radioactivity. I was lucky enough to check out an early build of the game being played by a member of the development team. What immediately caught my eye was how differently the game played compared to a traditional first-person shooter despite the many similarities. The most noticeable change is just how the player moves around in the environment. Since players are controlling an aquatic vehicle instead of a human body, there’s a lot of drift to the movement. So, if the player stops moving to the left, their ship will still continue to move in that direction for a few seconds. It makes movement, which is typically a direct and fast-paced part of shooters, into something very tactical. The other big change is that combat is almost always fought at a distance. There’s no faster way to lose a battle than by getting up in an enemy’s face, as there’s no good way to dodge gunfire up close. Managing distance is key, and the developer told me that many beginner players have a hard time adapting to this different style of gunplay. These differences are what make Aquanox stand out, and it needs to offer something unique if it wants to successfully find a niche within the genre. Despite these changes, there’s still a lot of features of a traditional FPS at play. For example, the vehicle’s weaponry range from shotgun-style weapons to what is essentially a sniper rifle. Since two weapons can be equipped at once, it also adds a layer of dual-wielding strategy. Since the game features four-player cooperative play, I could see making sure each player has different weapons ready at their disposal being very important. Another important aspect of Aquanox is salvaging materials and weapon ammo from sunken ships. Currency is extremely rare in the game world, so players will be encouraged to craft their own upgrades more often than not. It’s still possible to spend in-game money on items, but I was told this shouldn’t be the player’s default method. Digital Arrow wants players to always think before they act, and that applies to all facets of the game. While most of the demo I saw focused on a single-player mission, I did get to see a quick multiplayer match (with bots) at the end of my appointment. The action I saw reminded me of an arena shooter, as the ship was picking up new weapons around the map, and then using the game’s wide range of weaponry to blow enemy ships to bits. Both modes seem to be fleshed out, and it looks like Aquanox Deep Descent will offer two distinct modes. With so many first-person shooters feeling like they’re being done by-the-numbers, it’s refreshing to see a game like Aquanox Deep Descent come along. By combining quick reflexes with strategy and resource management, Digital Arrow has created something unlike what’s currently on the market. I’m excited to check out the game for myself, and further learn the intricacies of gameplay, when it releases later this year. 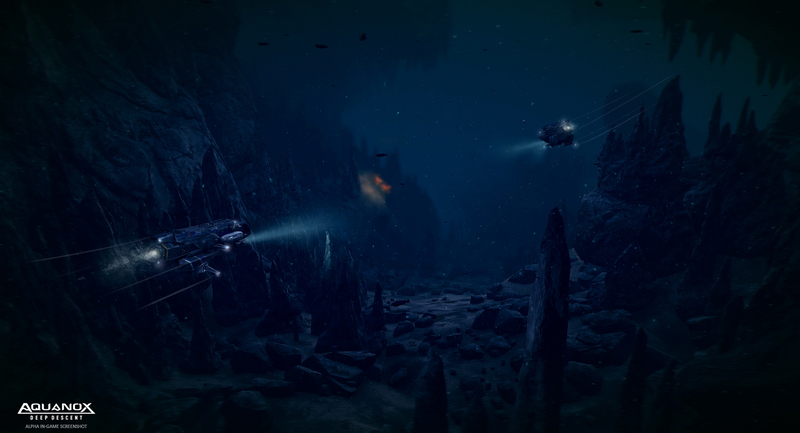 Aquanox Deep Descent is set to release later this year for PlayStation 4, Xbox One and PC. Previewed on PC.